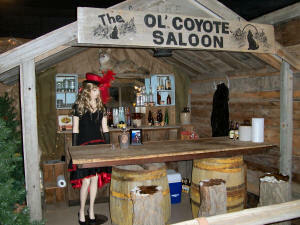 All of the stores replicated in the basement were named after original businesses at that time, except the saloon. Leoti did not have a saloon at that time. If you wanted some wine, spirits or liquor, you went to the drug store and purchased it for medicinal purposes. Oh yeah, I remember hearing about snake bite medicine! As you ride up to the saloon, you may tie your horses at the hitching post in front and then step on in to the Ol’ Coyote. The bar top is set on top of a couple of old whiskey barrels with three wood stumps for bar stools make great sitting, especially after Ken Bishop covered them with hand-tanned calf hide. 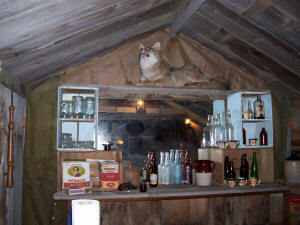 The back bar was made by Karen and covered with old wood shingles from Dave Brandt that we have used on so many of our projects. Eula Mae and Bob Smith donated a mirror from the Three Way Store for the back wall. A stuffed coyote, the mascot of the saloon, sits on a shelf. A deer skull and deer hide hang on opposite walls. The hide being hand tanned with the brain of the animal by Ken Bishop. Stacked on the back bar are old wooden apple boxes donated by Janis Marcotte, they make great shelves for the collection of shot glasses from Margie Taggert and donated by her daughters, Lorna Wiegers and Sandy Quartermont. At the back of the bar are four very unique and collectable bottles that came from old Fort Custer, Montana. If you are a bottle collector, you would find these very interesting because of the different ways that the bottles were made. One is a brown Schlitz turn mold quart beer bottle, a clear 3 piece mold whiskey bottle, a Budweiser whittled quart beer bottle and another brown whittled quart beer, with the markings A&D.H.C. on the bottom of it. These were all found at the fort. There are a variety of other bottles in our saloon from Margie. Another collection of Margie's are seven little mugs with the faces of old English gentlemen on them. 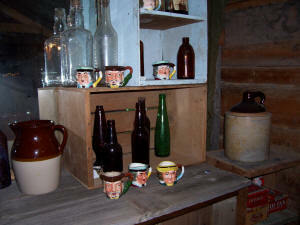 Several of Clyde Blackburn's old crock whiskey jugs sit on the shelves and bar top. These all give a nostalgic appearance to the old saloon. A checkerboard hangs on the wall for a little entertainment on a lonely night on the prairie. Probably a few games of poker kept them occupied, too. Just in case the bartender has a little difficulty with his patrons, he has a billy club hanging real handy, also a small derringer pistol when things get real serious! Just to the south side of the saloon stands an evergreen tree-row where you will notice a pheasant tucked in under the branches, stuffed and donated by Judy Lechtenberg. And behind this tree-row hides an old whiskey still. It must be a secret where it came from because Clyde just said "a man" donated it, and not a shred of paperwork can be found as to who was that man! I guess the secret went to the grave. But, it gets a lot of laughs by visitors of the museum. 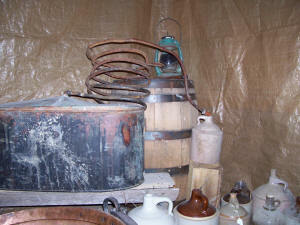 Several more jug, bottles and fruit jars sit around the still.